Matte gold graduation gowns, most commonly worn by students graduating in mathematics or science, are an elegant option that will have you looking incredible for your monumental day. Celebration time is almost here, after working so hard for so long the wait for graduation is finally over. As your family and close friends come together to honor your efforts be sure to reflect on all that has brought you to this point. Thanks to your consistent determination you have successfully reached your goal. Graduation does not come easy, but after facing countless challenges and overcoming each of them you now know that you can do anything you set your mind to. Most likely it wasn't all bad though, I'm sure you met a lot of friends and made plenty of great memories that you will always cherish. Your graduation symbolizes the victorious completion on this part of your journey. Here at Honors Graduation we have everything you need to be prepared and accept your degree or diploma the right way. Graduating students wear a cap and robe at the time of their ceremony and usually highlight their outfit with various accessories. We have all of your graduation needs here at Honors Graduation. Our Cap & Gown + Tassel deal includes your graduation gown along with the matching cap, plus we'll throw in the graduation tassel of your choice at no additional cost to you. We have a large selection of accessories available as well to help bring your outfit together perfectly, such as stoles, tassels, and graduation cords. In addition to matte, all of our graduation robes are available with a shiny finish. Whenever you purchase a graduation cap from Honors Graduation we will throw in a free tassel (of your color preference). Each of the individual items found in our inventory are also available for separate purchase. 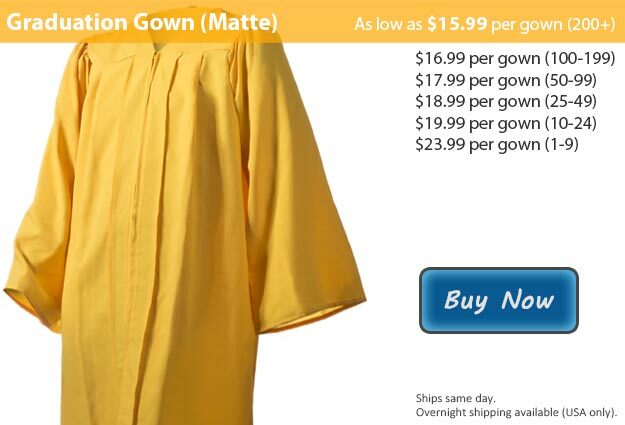 This graduation gown is also available in Gold Shiny Fabric.